"The best home is one you can afford. The Janion Micro-lofts can give you less-than-rent monthly payments..."
Rejoice young people. We built some garbage that you can afford. You buy now. Steve Keen has already said there is something wrong with the Canadian BIS data and he is doing a follow up post soon. I'll keep an eye out for the explanation. In 1975, the average size of a house in Canada was 1,050 square feet. Fast forward to 2010 and new homes being built almost doubled to an average of 1,950 square feet. A near doubling in size over 38 years is not something you can ignore when developing a new house price index. It will be interesting to see the follow up. But so far, all Keen has come up with is the observation that a lot of condos are under construction in TO — Not a hugely compelling argument. I do look forward to the analysis and I'm sure someone will do a good job - not sure it will be Steve Keen as he is Australian and a bit far from the on the ground experience. CS, the doubling of home size is a good point, but I have no idea how to account for it accurately. Not my field and I'm aware the land appreciates while the home depreciates and then you have to account for the pesky inflation factor. There's nothing wrong with the data. They're using NHPI data and inflation adjusting it. The point is it is completely useless for determining whether there is a bubble or not. They're using the New home price index. Home depreciation doesn't factor into it. As for the land component, it's an estimate of the land value from the developer. Not exactly very solid. Of course not. But in the end it makes little difference to the people buying. How many 1000sqft new homes can you buy right now? Basically zero (maybe a few out in Langford). So if you want a new home you need to buy a larger one, which means it costs way more. The point is that using the NHPI as a basis for determining whether houses are overpriced is totally off base. 30 years ago the average family may have been driving a Hyundai Pony that rusted if you looked at it sideways, whereas now they have an Elantra that has 9 airbags, 140hp, and gets 40mpg. The quality of the new car is miles ahead of the old one, but that doesn't matter if you're talking about that family's finances. It's not like they can decide to still buy that Hyundai Pony to save money. The only thing that matters is how much they are spending on that typical car. It's not like they can decide to still buy that Hyundai Pony to save money. Google shows me a few Ponys for sale in Ontario :-) Of course they'd be collector's items now. Because SFH buyers want and can afford more, and because those who like condos can buy one as small as 200 square feet. 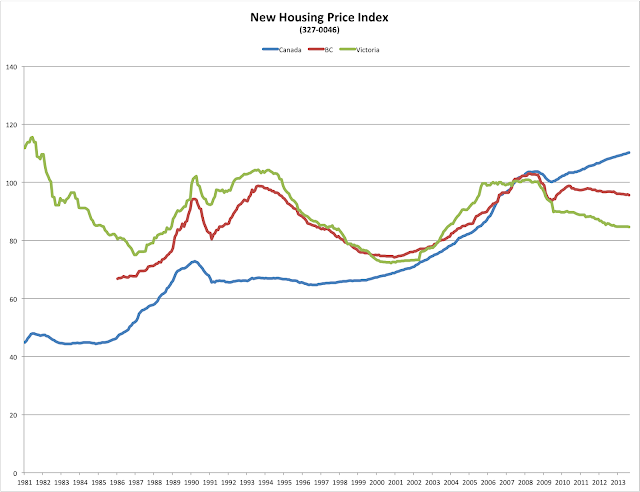 The problem with the new house price index is not that it is inflation/size and quality adjusted but that it takes no account of the fact that new houses are built on the urban periphery where land is cheap, whereas RE bubbles if they occur, happen most explosively in core urban areas where land prices escalate without any relation to construction costs. What's needed is a modified Teranet index that takes account of the effect of urban growth. In the last 33 years the population of Greater Toronto has grown 50%, that of Greater Vancouver by 66%. These changes, which are matched by similar growth of most other major cities, have increased the cost of commuting to the suburbs and exurbs and have thus increased RE prices in core residential areas. But that increase in price is not inflation or evidence of a bubble, it reflects an increase in real value, i.e., the increased saving in the cost of a daily commute to the periphery. We haven't had a boom in population in recent years, we've had a boom in prices because of low interest rates. This is an indication of a bubble. Your theory would mean that prices on urban housing would go up more than rural properties. However most of the housing market has increased in value substantially. Rural and urban. The effects of the real estate mania. Housing in small towns has increased substantially also. How do you explain that? I've tried to analyze dependency of MOI and price change based on your spreadsheet from the previous post. Unfortunately, didn't have much time to do that. The only sensible thing that I can share is the "SFH Median vs MOI" plot - see link below. Basically, the plot tells something that everyone already knows - expect 1% monthly price hike with 4 MOI, stagnant at 8 MOI, 1% decline at 1 year of inventory. Thanks again for sharing the source data. "One of the concerns that Finance Minister Jim Flaherty heard from economists during a closed-door meeting on Monday is that it’s difficult to properly assess the housing market because of a lack of data." All you need to know is that it is definitely not a bubble. Probably definitely. As much as in large towns? And did they increase substantially over the last 30 years when adjusted for inflation, quality and size? Most large Canadian cities have seen continued growth over the last 30 years, e.g., Vancouver with two point something percent in recent years. Greater Victoria's population growth has slowed in recent years, but then so have our house prices. Why are hung up on thirty years? Prices have doubled in 10 years. Prices in small towns are cheaper than big cities. However as a proportion of growth they have gone up just as much. If you would like an example check out Brandon Manitoba. Small town, huge boom. Too far from Winnipeg to be a suburb. As a percetage growth they've had a bigger boom than Victoria. What might cause urban house prices to slump is the continued increase in the proportion of the population happy to live in a downtown condo. In a city such as Victoria, there is no near-term limit on the number of condos that can be built in the core. A massive increase in condo construction could, therefore, reverse the trend in the value of land in the core zoned for SFHs, by creating an alternative to commuting for those unable to afford, or not wishing to own, a SFH in the core. Why are hung up on thirty years? Thirty years was the time covered by the inflation adjusted house price index referred to in the Steve Keen article mentioned in the last thread. Prices have doubled in 10 years. I have an alternative to letting the younger generation having the scraps of the Canadian housing market, a crash. Then we won't have to build more condos. There will be plenty of sfh to go around once the investors jump ship. Small town booms and busts are probably explicable only in local terms. It's quite possible for house prices to fall below construction costs in a place of economic decline. If something comes along to kickstart the economy, then prices boom, but its not telling you anything about the national economy or housing market. Does anyone else think that compared to the rest of the market in Victoria, SFH’s without a suite (and that can’t have one added) as well as needing a little work are unvalued? My thinking is that if someone has the money for a house without a suite they don’t want to do any work (ie. Someone more advanced in their career). Vs. a younger person buying a SFH and the only way they could make it work is to have a suite. They are more likely to be willing to do work on the house. When they happen all the way across the country? What does the whole country have in common? When they happen all the way across the country? House prices generally rise with inflation, but there is great variation in price and of rate of change in price from place to place. The gyrations of Victoria's RE market must be largely explained by local factors. For example, the doubling in price to 2008 occurred following the first full flowering of the Internet. Suddenly it was possible to market Victoria to the World. The Oak Bay Beach Hotel, for example, pitched its multi-million dollar condos to the international jet set via Sotheby's. With Google Street View anyone with a couple of million to spend and interested in a getaway, a tax haven, or simply a pleasant place to live could explore Victoria as a place of residence without leaving their own home or country. Then there was the Liberal Government that created a more a business friendly environment, thus making Victoria that much more appealing to footloose industries. And Gordon Campbell strongly supported the university. The profs. raked in their extra 5% year after year and multiple new buildings, faculties and special facilities helped create a construction boom. Now Victoria lacks a single governing party MLA. The university budget is squeezed, no new hospitals are on the horizon, and the lift from the Internet revolution is over, the $C is plunging so no more rush to invest here. No wonder were entering an economic trough?
. . . .SFH Percentage Price Decline From Peak. . .
-5.0%. . . . . . . . . . . . . . . . . . . . . . . . . . . . . . . . . .
-5.5%. . . . . . . . . . . . . . . . . . . . . . . . . . . . . . . . . .
-6.0%. . . . . . . . . . . . . . . . . . . . . . . . . . . . . . . . . .
-6.5%. . . . . . . . . . . . . . . . . . . . . . . . . . . . . . . . . .
-7.0%. . . . . . . . . . . . . . . . . . . . . . . . . . . . . . . . . .
-7.5%. . . . . . . . . . . . . . . . . . . . . . . . . . . . . . . . . .
-8.0% . . . . . . . . . . . . . . . . . . . . . . . . . . . . . . . . . .
-8.5% . . . . . . . . . . . . . . . . . . . . . . . . . . . . . . . . . .
-9.0% . . . . . . . . . . . . . . . . . . . . . . . . . . . . . . . . . .
-9.5%. . . . . . . . . . . .X . . . . . . . . . . . . . . . . . . . . .
-10.0%. . . . . . . . X. . . . . . . . . . . . . . . . . . . . . . . .
-10.5%. . . . . . . . . . . . . . . . . . . . . . . . . . . . . . . . . .
-11.0%. . . . . . . . . . . . . X. . . . . . . . . . . . . . . . . . . .
-11.5%. . X. . . . . . . . . . . . . . . . . . . . . . . . . . . . . . .
-12.0%. . . . . . . . . . . . . . . . . . . . . . . . . . . . . . . . . .
-12.5%. . . . . . . . . . . . . . . . . . . . . . . . . . . . . . . . . .
-13.0%. . . . . . X . . . . . . . . . . . . . . .X. . . . . . . . . .
-13.5%. . . . . . . . . . . . . . . . . .X. X. . . . . . . . . . . . .
-14.0%. . . . X. . . . . . . . . . . . . . . . . . .X. X. X. . . .
-14.5%. . . . . . . . . . . . . . . X . . . . . . . . . . . . . . . . . .
. . . . . . . .S. O. N. D. J. F. M. A. M. J. J. A. S . . . .
. . . . . . . . .2012. . . ./. . . . . . 2013. . . . . . . . . . . . . .
Prices at the lower end of the Greater Victoria SFH market have declined 14.2% from the peak. This is in direct contrast to what is happening in most US cities. Note that the US housing market crashed recently and that it is much easier for price gains to be made when house prices are a lot lower (in the US) than the bubbly prices that exist in Canada right now. For those of you who think that higher prices in the US might translate into higher prices in Canada, think again. The Canadian housing market is about to go through a major multi-year correction/crash. Canadian banks are predicting a 10% correction. Since Canadian banks have a vested interest in keeping house prices high, it is safe to say that this is a conservative estimate on their part and that the actual correction will be much more than 10%. 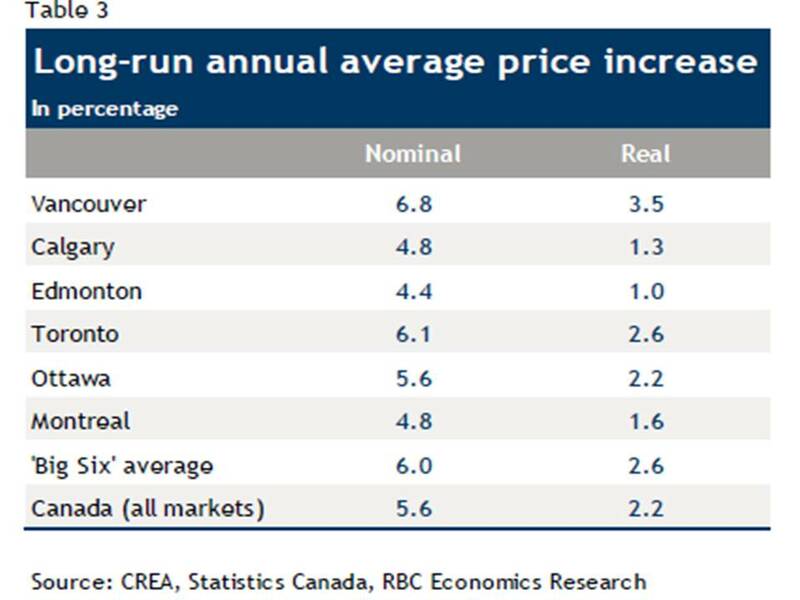 Victoria's price decline from peak leads all Canadian cities. Note that the cities in the US that were the biggest price gainers were also, in general, the biggest price losers. As well, in the US, the cities that started to correct/crash first (think Victoria) experienced, in general, the biggest overall price declines from peak. Most people don't get earthquake insurance because they are confident that the government would step in and pay for the damage cause by an earth quake. I find this extremely far fetched. The government paying for repairs for some of the most expensive real estate in the country. They'll go broke. I think they don't get it because it's extremely expensive. I believe it cost us about $870/year. "I believe it cost us about $870/year." Is that on top of the regular house insurance? I was at the sales center today and these are selling quickly! Saw three buyers of various ages writing contracts. They have a mock up 260 sq/ft unit in the showroom. If I was single I could see myself in one of these, preferably one of the 352 sq/ft units with harbour views. "If I was single I could see myself in one of these"
You kind of have to come to terms with the fact that you'll have to remain single because you won't have room for another person. Hopefully these investments will be salable when these people have to move on. I saw a couple in their 60s buying one. Run into a realtor there who had a client from Vancouver purchasing one just for weekend use so there appears to be a market for these other than just single professionals. Rentals are also allowed, so when you do meet that special person you don't necessarily have to sell. > I saw a couple in their 60s buying one. Work hard folks, lest you find yourself looking at a matchbox to inhabit in your golden years. Although I must admit some of the new micro lofts do look pretty cool. Just hope that special person has their own (and larger) place, because renting out that match box is going to be cash flow negative. From my experience with downtown condos the lower the initial investment usually the better the return and the lower the chance of being cash flow negative. I can't see these renting for less than $700 per month? Strata fees are low because of the size and you get a 10 year 38% break on property taxes because of the heritage component. Canadian banks are predicting a 10% correction. Since you posted this twice perhaps it's worth pointing out that the reference you give to "banks are predicting" is to an August 2012 news report on a statement from a single bank, and that, since then, prices nationally have increased not decreased. You refer to SFH in Esquimalt, Sidney, Colwood, Langford and Sooke as the lower end of the market. But that is surely not a good measure of the lower end of the market since there are plenty of million dollar plus homes in all of those municipalities. I bet if you divided the market into deciles or quintiles or whatever according to price, you would find a larger decline at the lower end than you are showing for any collection of "low end" municipalities. If so, that would support my contention that an increased supply of good quality condos. is undercutting the market for low end SFHs not only in Esquimalt, Sidney, Colwood, etc., but also in the core. But actually, that is what many old folks probably want. Vacuuming ten thousand square feet every week, not to mention cleaning the eight bathrooms, is a drag. And when one gets very old, one may want a matchbox with restaurant and other services attached. The victoria market is on a slow increase compared to the last few years. On the VREB website you can compare 2012 September sales to this years September Sales and notice an increase of about 15%. Also there are a lot of new condos being built around town that are selling out before they are sold. An example of this is The Soverign downtown on Broughton Street. It was completed in September of 2013 with 75% of the units already sold before completion. That's not a sign of a slow market is it? There may be some parts of town that are slow, or slow areas. Sure the market is slower then usual but it's still steady. The pre-sale market is not a transparent market at all. These are just options to purchase. You would have to look through every offer on a pre-construction complex. Some of the offers will collapse, some are multiple units bought by investors and realtors. Some times the complex contractors are paid off in units. And a lot has to do with getting a specific percentage "pre-sold" to get bank financing. A pre-sale contract doesn't necessarily mean the suite is sold. If you're easily impressed by signs that say "75 percent pre-sold" you might want to do a little more digging. Ask to see the contracts to purchase. Ask the agent selling the suite, if he or his company had to buy a certain percentage to get exclusive rights to sell in the complex as these units will be coming back on the market - once the develper's units are sold. Sometimes you have to salt the mine to get people to buy. Even the pan-handlers know to drop a couple of bucks in the hat before they pass it around. I don't think there is really anything evil about doing this - it's just marketing to get sales started. If the buyer doesn't ask - why tell them. When buying into a micro condo complex you will have a greater annual turn over of suites than other non micro complexes. If you look at the adjacent micro condo complex, the annual turn over rate lays between 10 to 15%. Close to double that of a non micro. That high turn over rate will always cause prices to be suppressed in the building. If we do have another boom in real estate the micro condo will be the last to begin to appreciate. "Also there are a lot of new condos being built around town that are selling out before they are sold. An example of this is The Soverign downtown on Broughton Street. It was completed in September of 2013 with 75% of the units already sold before completion." Sean, you said lots of condo's have sold out before completion and yet the one example you provide didn't sell out? "You refer to SFH in Esquimalt, Sidney, Colwood, Langford and Sooke as the lower end of the market. But that is surely not a good measure of the lower end of the market since there are plenty of million dollar plus homes in all of those municipalities." Esquimalt, Sidney, Colwood, Langford and Sooke represent the lower end of the SFH market. Nobody can argue against that. SFH prices in those areas are, in general, the lowest in the Greater Victoria area. If you disagree with me on this, then you also disagree with Leo. There are over 700 condominums for sale just in the core districts alone. 360 of them are in Victoria City and 130 of those are downtown. Likely this month 20 condos will sell in the downtown area. 45 in all of the city and about 100 for all of the urban municipalities combined. The median price for condos in the core being $280,000 or $280 per finished square foot. The cheapest selling for $96,000 and the most expensive at $1,250,000. That's one f^&%$ of a location adjustment when you can almost see each condo from the roof top of the other one. The highest price per square foot rates are downtown where you might pay $390 a square foot for 810 square feet - which would fit almost 3 micro condos at $190,000 each into it. No wonder developers want more "affordable" housing for the downtown area. Affordable housing means BIGGER profits. 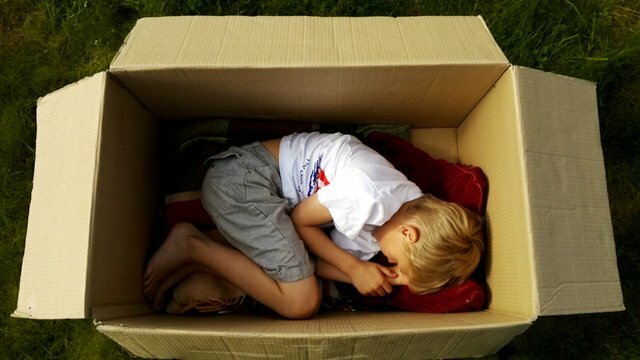 Unfortunately this type of affordable housing forces families out of the city. People stop going downtown after 6:00 PM. They choose to shop and spend their money away from the downtown core. This is what almost killed New York City in the 1980's. All condominiums complexes should have a suite formulae that the complex has to average 2.5 bedrooms. That will bring prices down and families back to the city. All that is being built today is the slums of tomorow. The last one to leave the City please turn off the lights. Sure, I don't argue that old people might want condos, but I suspect most old people would rather have a reasonably sized one (say 500-700sqft) rather than sub-300. Old people tend to come with a lot of knickknacks. I like the way you are thinking! And if you disagree with me you are also disagreeing with the baby Jesus. Re: Sooke, et al at the low end of the market. Well, there are a couple at over five million and nearly two dozen at over a million. Some low end. Langford, Esquimalt and Sidney all have their share of million plus homes. Sidney even has a two-million-dollar condo. That's more than you'd have to pay for a 1000 square foot pied a terre at the Oak Bay Beach Hotel. I think, Info, you need to reconsider the way you define the market. These are outliers though. They won't have much of an effect on the median. Barring access to full sales data where you could do price bins, I think looking at regions is OK. I don't think "old people" are buying these to actually live in them full time. Hard to tell if you are being serious or not. There is essentially zero demand for three bedroom condos. An average 2.5 bedroom complex would end in receivership quickly. Very rare for developments to sell out prior to completion in Victoria other than blistering markets. Victoria is a slow and steady type of market. The Mondrian for example was only 35% sold on completion but since completion they've been consistently selling 4-5 per month. If you sell our prior to completion the developer probably left some money on the table. I think 85 to 90% sold out on completion is probably ideal. In considering price trends it seems odd to consider SFHs and condos separately. After all, a condo does not normally accommodate more than one family, whereas many so-called SFH's have a suite and thus accommodate two families. But if condos and SFHs are considered together, then the bulk of the low end market is in the core, not at the periphery. This means it's impossible to judge what's happening at the upper and lower ends of the market by diving the market into upper- and lower-end municipalities. Re: "access to full sales data where you could do price bins"
Are these data definitely inaccessible? It's difficult to see how one can get much insight into the market without such information. There were two sales of sub 400 square foot condos on the mls for the last 12 months. During the same time period there were 38 sales of 3-bedroom condos. What was that about "zero" demand for 3 bedroom condos again? I agree with Jack. If you're gonna buy a condo, make sure it's over 1000 sq ft. The Zoomers in their 3000 ft mansions aint ready to downsize into micro-coffins yet. "I think, Info, you need to reconsider the way you define the market." Leo showed that certain areas of Greater Victoria definitely belong in the lower end of the SFH market while other areas clearly belong in the upper end of the market. As Leo said, million dollar home sales in the less affluent areas are outliers. There are probably outliers of this sort in every major Canadian city. Nitpicking will not change the fact that SFH prices in the lower end of the Greater Victoria market have declined 14.2% from peak. It seems you are approaching this subject with the same logic that you used to try to argue that there is no such thing as overvaluation. If you could have it your way, there would be no such thing as overvaluation, no high end areas and no low end areas. I'm sure there are other things to which you apply this faulty logic and I'm sure it is only a matter of time before you reveal these things to the readers of this blog. 1972 built steel and concrete bldg. All rooms have terrific views. Lndry room, huge living room, bedrooms are 18X12 and 13X12, two four piece baths and has hot water heat (I think). Heat and H/W are included in monthly fees. It went on the market 9 months ago. What do you think Marko? Jack? Obviously I don't like micro condominiums. I think they are a waste of a valuable resources. Created only for short term profiteering by developers. That will lead to more crime in the downtown core as hundred of units sit empty with few families venturing downtown. I would have preferred the City council to have embraced long term low rise family housing rather than transient renters and owners crammed into Bento Boxes. And not pollute our skyline with concrete edifaces to the follies of past mayors and councils. For Christ's sake, we already have one Vancouver - we don't need another one. It seems like a great price. The concern for me is that the contingency fund has been held at 50 percent of the annual revenue which is about $140,000 or about $3,000 per unit. That's not much for any shocks like repointing the brick exterior and upgrading the windows. A good portion of that contingency fund would be lost in a new roof or elevator. No depreciation report and no property disclosure statement on this one, so I'd guess there is the chance of seeing the monthly strata fees increase substantially from the current $456 a month. There was a time when the pictures of the interior were worth looking at to get an idea of the space. Now that all the agents are $#%$ing around with their cameras it's hard to get a sense of the space. But it seems spacious. If I were looking for a condo - this would be on my short list. Oh yeah, another thing. I would gut the condo and turn it into a 3-bedroom. Or at least a two-bedroom and den. Both TD and Scotiabank predicted that Canadian house prices would correct by 10-15%. Thus, saying that Canadian banks predicted a correction was correct. TD (July 2011) predicted that Canadian house prices would fall by over 10%. Scotiabank (August, 2012) predicted a 10% price cut. If there has been an update with regard to either of these two predictions, I have not seen it. House prices across Canada (except in Victoria) have increased since the time of these predictions. However, this does not mean that TD and Scotiabank no longer envision house prices across Canada correcting to the level that the had in mind at the time of the predictions. In general, the bigger the bubble, the bigger the crash/correction. Oddly coincidental/pertinent that two of the three bedroom condos I've looked at have had price drops today. Every possible factor that can be used to determine the size of a national housing bubble shows that Canada's current bubble is much bigger than the 2006 US bubble. Canada's price-to-income and price-to-rent ratios are currently much higher than the same ratios at the peak of the 2006 US housing bubble(bottom two charts). So TD's prediction is already wrong. Two years ago they called for prices to fall nationwide by more than 10% over the next "couple of years". Well guess what - a couple of years have passed and it didn't happen. Damn that prediction thing is HARD! Scotiabank said 10% correction in two to three years. So they still have 1.75 years for their prediction to come true. Ok price. Drawbacks are no deck, non-secure parking is a problem for that area, 1972 would likely have fuses instead of circuit breakers, low amperage for modern day electronics and 3rd floor would'nt give more than a couple blocks view. What looks like might be ocean is a fog bank in pic. Also high monthly fees with pool risk. I know someone in the building and old buildings with pool are scary. Probably cheaper over the long run to pay a nearby hotel to swim there, even its 25 bucks a swim. In case anyone missed it the bank of Canada has changed it's policy on forward guidance. This means that they are not confident that the next movement in variable interest rate will be up or down. If you consider this good news you should also consider why they keep decreasing their expectations on growth of the economy. We need something to take the place of housing because the "excess capacity" in the economy is starting to run dry. The next thing to watch will be if Obama nixes keystone. Things will get interesting. tldr; Interest rates are going to stay low for a long time. Time to buy that second and third property. You never lose on real estate. > I don't think "old people" are buying these to actually live in them full time. So it's just the world's most expensive hotel room. Probably a better investment than most time shares. 38 out of 1500+ sales? When you dig a bit deeper into it 9 of those are over $700,000 so I doubt anyone with kids or an actual need for three bedrooms was dropping that kind of cash. 10 of the 38 had age restrictions, some 55+, once again, probably purchased without the actual need for three bedrooms. The pure demand for three bedrooms is actually very small. Lack of new three bedroom condos is extremely well documented in larger cities such as Toronto. It all boils down to extremely poor market demand and uptake. Developers have tried it in Victoria and it didn't fly. Chard Development built the Corazon (2005), Juliet (2008) and 834 (2011). All three buildings are within a few hundred feet of each other. The Corazon had a number of three bedrooms and 2 bedroom + den layouts. Next came the Juliet and it only had two bedroom and one bedroom units, with more than 50% being two bed. At the 834 one bedrooms made up more than 70% of the units and it was an extremely successful project. Another example, the Bayview had many three bedroom units. The Bayview Promontory, currently under construction, has 177 units with no three bedroom units. It has a mix studios, one bedroom, two bedroom. Conclusion, no interest in three bedroom condos and won't be for a long time. If there is no market downtown Toronto the odds of one being created here is far less. The drive to the Westhills is probably a lot shorter than from downtown Toronto to GTA suburbs. If there was any kind of demand developers would provide. Just not seeing it in real life. I started my real estate career at the asbolute peak of the market and 400k homes I was showing back then I just don't see going for 345k on average. You can always find an example in Sun Rivers or some other pocket but that isn't the average. You and councillor Madoff have a lot in common. She is anti-development and at the same time pro-affordable family housing. It doesn't make any real life economic sense. Every "concrete edifaces," that goes up has approximately 50% rentals and 50% owner occupiers. It takes pressure off the rental market and gets owners into downtown. It also creates for a more vibrant downtown core by increasing density. Overall, I think the Janion project will be a huge success especially from the commercial space and street integration component. Will certainly be a lot better than what is there now, which is nothing. Yes, in an ideal world the Janion Hotel would be restored to pristine condition without a new addition and would feature five 3 bedroom condos above the commercial space priced at an affordable $299,000 entry point. Unfortunately we live in reality and for the developer to make the project viable he needs to sell 130 microlofts. The hotel didn't sit there for decades because development is such an easy money making gig. Seems like a "good deal," but strata fees of $462/month are concerning. They were $380 only two years ago. There is sensitive to starta fees especially when you start pushing $500/month. No rentals is a bummer when you have to sell in a crap market, especially as that condo would rent well in that location if updated a bit. Marko said, "creates for a more vibrant downtown core by increasing density." How does low-cost housing create a vibrant downtown core? More people with lower incomes who cannot afford to partake in the "vibrant core activities"? This is an over hyped and seldom proven to be a reality "sales pitch" and nothing more. Where did I refer to low-cost housing in that context? Nothing "low cost housing" about private sector developments downtown. My feeling is let the free market dictate what should be built. If there is demand for three bedroom condos let the market build that and if there is demand for microlofts build that. Either or is better than having decaying buildings sit for years or walking past parking lots. Nothing vibrant about that. Either or is better than having decaying buildings sit for years or walking past parking lots. Our council talks a good game on densification and downtown revitalization, but then they do everything possible to obstruct it. "Sometimes you have to do a little digging in order to determine whether or not my predictions are correct." Don't hit any buried gas lines! Let's look at the success rate in listing condomminums by number of bedroom. And guess what has the highest success rate! The market has spoken. 3 bedroom re-sale condominums outsell micro condominiums. So why aren't the developers building them? When a city council relaxes the size and number of units that makes it more profitable for the developer to build. It has very little to do with what the market wants - it has everything to do with profit. When developers wanted to build residential towers with fewer parking spaces to reduce their costs. They sold it to the city as work/live condos where you don't have to own a car. Did people get rid of their cars. They just parked them along the streets in the single family areas, thereby increasing congestion in someone else's hood. By creating more micro condo's are you increasing the affordability of housing? You're creating cheap hotel rooms sold to tourist by the day and week. And how long do you think Victoria can keep selling itself as a destination spot when it looks the same as the city the tourist is leaving. Last one to leave the City for Langford - please turn out the lights. Just Jack....have you considered becoming a developer or approaching a developer about your 2.5 bed average unit complex? The current developments are being built by some huge players (Concert, BOSA, Anthem, etc.) Even Chard who has built 5 building in Victoria in the last 8 years is a smaller player. If there was demand for three bedroom units I think BOSA or Concert would figure that out. Regarding parking. Promontory has 217 spots for 177 units. Era has 104 spots for 157 units. There are so many variables involved that you don't see. For example, at the Era the water table is very high and it was impossible to go down another parking level. Every project is very unique. As far as developers selling the city on less parking, let me guess, developers are also selling the city on removing car lanes to add bicycle lanes? I don't think so....it is a direction the city is promoting. It has very little to do with what the market wants - it has everything to do with profit. Developers run a 10 to 15% margin. When you don't allow for a viable profitable project they just don't build. Would you take a huge risk for a projected loss? Probably not. As I said previously....the Janion sat decaying for decades for a reason. If there was any way to make a profit converting the Janion into a three bedroom condo oriented development someone would have done it a long time ago. When you have 50 to 200 units to sell at a development 30/44 means very little. Janion already has over 35 microlofts under contract. They will sell more microlofts in a few weeks than all three bedroom sales in Victoria for a 12 month period. "Nitpicking will not change the fact that SFH prices in the lower end of the Greater Victoria market have declined 14.2% from peak." "Just not seeing it in real life." The 14.2% price decline is fact. Help, have just read the latest VREB report. Sales have surged from last month - got it! But, can anyone help decipher the rest for me - it's getting too confusing! "So TD's prediction is already wrong. Two years ago they called for prices to fall nationwide by more than 10% over the next "couple of years". Well guess what - a couple of years have passed and it didn't happen. Damn that prediction thing is HARD!" You are missing the point about the bearish real estate predictions of Canadian banks. It doesn't matter whether or not their timing was correct, all that matters is that Canadian banks are bearish on Canadian real estate. How often do banks predict that house prices will fall? It rarely happens in any country. This should have been an eye-opener for you, however, you chose to interpret it in a way that supports your bullish views on real estate, completely missing the point in the process. Info, you lose a lot of credibility in my eyes when you say "this is fact" when you're completely contradicting sources like Teranet, and just saying "I'm right, I'm right, lalalalalala everyone else is wrong." You're interpreting certain data that other large and credible sources are interpreting in different ways. Saying that's fact is like me saying the Flying Spaghetti Monster is fact and global warming being caused by the decline in swashbuckling pirates is fact. Plus, caveat emptor totally caught you, at least own up to it. "Info, you lose a lot of credibility in my eyes when you say "this is fact" when you're completely contradicting sources like Teranet, and just saying "I'm right, I'm right, lalalalalala everyone else is wrong." The 3-month median is a very reliable way to calculate the total decline from peak. It is a tried and true method of determining price increases and decreases in any housing market. Teranet's results appear to be skewed upward in the same manner that the overall SFH median has been since April. The Teranet index is put together by bankers. Banks have a vested interest in keeping house prices high in Canada. In the US, the Case-Shiller index is an independent (and therefore reliable) source of data. Realtors and bankers cannot fudge the Case-Shiller index data. The MLS HPI (realtors) is available for several Canadian cities. The results for the MLS HPI closely mirror the results for the Teranet HPI (bankers) for all cities that both HPIs are available. Again, both bankers and realtors have a vested interest in keeping house prices high in Canada. "You're interpreting certain data that other large and credible sources are interpreting in different ways." Be more specific. What other large and credible sources? The VREB and their comparisons of the 2013 overall (skewed) median price data to 2012 price data is giving the wrong impression. If you disagree that extreme upward (median) skewing has been in effect since April, then perhaps you might consider going over Leo's write up on the subject. As I have said before the pre-construction market is non transparent. Publish the names of the buyers and how many units they bought! Doesn't matter - as I've shown, the re-sale market for micro condominiums has the lowest success rate in Victoria. Janion is just a building comprising 58 hotel rooms. The upper end SFH total price decline from peak for October remained (basically) unchanged from September (-10.6%). This is based on 3-month (sales weighted) median data. Tapering is a gradual process. The rate hikes took place over a number of months. Some of the increases were as late as July, August and September. Similarly, the sales boosting effect of the rate hikes will taper off in a gradual manner. I have exposed the fact that SFH prices at the upper and lower ends of the Greater Victoria market have declined 10-15% from peak. I said this was the case a number of months ago and a lot of bulls on this site disagreed. It turns out that I was correct. I'm specifically referring to Teranet and HPI, and I don't believe you can dismiss their results simply by stating that they have a bias. You need to debate against their data and methodologies in order to invalidate their conclusions, not their inception and funding. Stating their bias is fine to set the stage for skepticism, but it is not a way to make a conclusion. With regards to the skewing, I understand the argument that you're making, but I don't believe it's strong enough to state as fact that you're right and two thorough indexes are wrong. You showed a wide trend, and then extrapolate that to specific numbers for the whole market. You just haven't proved it, so you shouldn't claim it's fact. Until you show the same level of rigor in either generating a number you claim, or refuting Teranet/the HPI, I'm going to believe them over you. 2009, 2007 and 2006 were the last 3 years that Greater Victoria experienced price gains. "With regards to the skewing, I understand the argument that you're making, but I don't believe it's strong enough to state as fact that you're right and two thorough indexes are wrong. You showed a wide trend, and then extrapolate that to specific numbers for the whole market. You just haven't proved it, so you shouldn't claim it's fact." I have proved it. Leo's charts prove that extreme upward skewing has been in effect since early spring. Separating the upper and lower SFH markets and calculating their individual SFH medians removes much of the upward median skewing. Comparing the medians of each of these individual markets to the overall (skewed) median again exposes the upward median skewing. "You showed a wide trend, and then extrapolate that to specific numbers for the whole market." I don't think you understand what I have done or how it proves that extreme upward skewing has been in effect for months. And you are missing the point that posting already wrong predictions does nothing to bolster your credibility. TD predicted something would happen in a given time frame. It did not happen. That means their prediction was wrong. It is NOT a difficult concept. A reasonable person would interpret "then sales will tank" as meaning sales would quickly decrease. So a question for you info. Does "tanking" and "tapering off gradually" mean the same thing to you or did you change your prediction? The only facts are the actual sale prices. Indexes whether from Teranet or elsewhere are just estimates of the total market cap based on those sales. You can certainly support or criticise the methodology behind any index, but you can't prove it correctly predicts what every property would sell for. Except that it hasn't crashed like in the US and we have a number of key differences such as our lending system. We'll see. The VRB is, however, now using the home price index. It seems that this index shows a modest decline in benchmark house prices in Victoria rather than the flat line that medians and averages show. The data shows that the benchmark house in Oak Bay was $795,900 three years ago, and is $754,500 today. A house in Victoria was $593 000 three years ago, and is $563,100 today. Sidney condos and gulf island properties appear to be down the most. Why are arrears rates down? I have a friend who is a home owner and is in debt (non mortgage). He asked me how he can I get out of debt. I told him that he needs to go minimalist and pay down the debt. The more you pay down each month the faster you'll be debt free. Six months pass by and my friend calls me and tells me that he is now debt free. Amazing! I exclaimed. How did you manage to pay down all that debt in such a short time? Well you see the value of my house increased. I was able to roll my debt into my mortgage. Because the interest rate on my loan is so much lower than my credit card, my mortgage payments only went up slightly. Wealth generated from thin air. Homeowners in Canada are a lucky bunch.